Carrying a new credit card can be a rewarding experience, whether it is your first card, the only one you plan to possess, or you are adding it to the list of multiple kinds of credit cards you already have. But in recent years, particularly since the credit crisis of 2008 that triggered the Great Recession, banks and other credit card issuers have tightened their application rules and policies. It may not be as easy to qualify for a card these days, for instance, and to help ensure that your credit card application is a success it definitely helps to follow some tips and protocols. There are a number of things that you should avoid, for example, so that you have a great chance of credit card application approval. Before you decide to fill out a credit card application, make sure that you have not forgotten to stay informed about your credit score and overall credit history. Credit scores and other information archived in your credit files count significantly when banks scrutinize your credit card application, and if your credit is suffering it may sink your chances of approval. That’s why you should plan ahead and give yourself time to review your credit score and, if it is necessary, take steps to raise your score before turning in a credit card application. The higher your score is at the time that you apply, the better your chances will be of not only getting approved for a credit card, but also getting approved for a higher credit limit. Excellent credit scores may also entitle you to preferential treatment in the form of more attractive, lower interest rates and other cardholder perks. By law you are entitled to check your credit score and review your credit files once a year, free of charge. Take advantage of that opportunity and make sure your credit is a strong as possible prior to applying for new plastic, and that will give you a wonderful advantage. As you probably already know, the opposite is true for those who have poor credit. For them it can be more difficult to get approved for a credit card, especially one with an affordable APR and user-friendly terms. Even if your credit has been stellar, it can be dramatically damaged if you make any late payments on bills you owe – and especially if you fall behind and default on a credit card or other type of loan. So the next big thing not to do when applying for a credit card is missing a payment. Don’t be late paying the monthly amount due on any kind of debt including your student loan, auto loan, credit card, and even your rent or mortgage. As long as you do not make that mistake it will help to preserve your credit, which is exactly what you want to have happen if you are planning to apply for new plastic. Oftentimes consumers who are looking for a new credit card will apply for more than one at a time. There are several reasons for this, and one is that they want to apply multiple times so that if the application for one card is rejected, they still might get approved for one of the others they applied to get. Another common practice is to shop around and do research to determine what the top 2-3 cards are that you might want, and then apply for each of those. But although this may sound like a good strategy, it is a big mistake. Don’t ever apply for more than one credit card within a reasonable period of time. If you decide to apply for a card now, for instance, you will want to wait until you find out whether that application was approved or not before attempting another application. Increasing your applications does not increase your chances of approval, and it can actually have the opposite effect. Why is this? Each time you apply for credit, the lender or bank will access your credit score and credit reports. If you apply more than once, that activity of bankers checking your credit will be recorded each time it occurs. Then if another lender checks your credit history and notices that you have been applying for credit cards elsewhere, they may interpret that to mean that you are desperate to get approved. To a lender that indicates that you could be in financial trouble and need credit in order to borrow more. That may or may not be true – but that is how banks and credit card companies tend to see it. As a result, multiple requests to access your credit information by lenders can weaken your credit – just when you need it the most. So hold off on those other applications and only submit one for the card you want the most and believe you have the best chance of qualifying to receive. That means all forms of credit or borrowing, not just credit cards. It is best to put the brakes on any new loan applications, including auto loans, bank lines of credit, student loans, and even applications for department store charge cards. The idea is to limit your requests for credit to just the one particular credit card you want to get, and to maintain this restricted activity for a month or more prior to submitting your application. 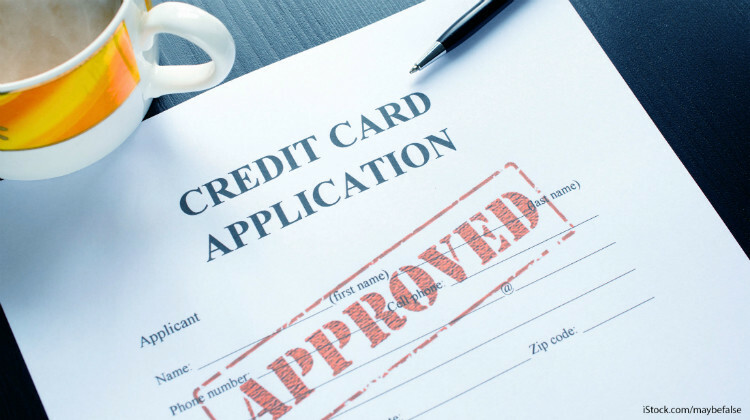 Even after you have submitted your credit card application, you should still refrain from making any other applications or requests for loans or credit, until your application has been fully approved and you have the credit card in your hand. If you are shopping at the mall, for instance, and the store offers you a discount on your purchase if you will just apply for their credit card, don’t take the bait. Politely decline that invitation and wait until after your credit card application process is completed, to maximize your chances of approval. Likewise, you don’t want to max-out whatever available credit you may have. Borrowing a large portion of your available credit weakens your credit score, so if you are applying for a new card you should resist the urge to use your other credit cards and charge accounts. Instead, try to pay off the balances on your loans as much as possible, because that can quickly boost your credit profile and enhance your chances of a successful credit card application. The same goes for balance transfer and cash advances, because those are just different types of financial products or tools that fall in the broader category of borrowing. The goal during the credit card application process is to try to show as little borrowing activity as possible. That will encourage lenders to approve you, whereas more borrower could make it harder for you to repay your obligations – and that always makes lenders skeptical. Some lenders have gotten very strict about their underwriting, which is the term used to explain the background research they do before approving loans. So the best policy if you are applying for a credit card is to put a moratorium on buying, until the application process is done and you have activated your new card. If you have been planning to buy a home, a car, a household appliance, or take out a loan for tuition then put those plans on pause. Avoid any spending sprees, because even if you are buying small ticket items like clothes or pizza, those transactions have a way of adding up really fast – until they amount to a big purchase. Once your credit card application has been finalized you can then proceed, but during the application process your focus should be on making and saving money while you simultaneously bolster your credit by paying off debts and not incurring any new debts. Do you need to see the dentist or buy a new pair of eyeglasses? You should never procrastinate when it comes to taking good care of your health. But talk to your health care provider and see if it is okay for you to delay those procedures until you credit card application goes through. They may be totally elective procedures so that it is okay to wait a little bit longer – and avoiding the expense might improve your chance of card approval. Since it is good to not use your available credit and not apply for other credit cards during this time, you might assume that it is also a good idea to cut up your other credit cards and close those accounts. Many people do this, but contrary to what many cardholders believe that can have a negative impact on your credit. Instead of closing other credit card accounts, just pay off the outstanding balance on those cards and then keep the accounts inactive – but don’t actually close the accounts. Having open lines of credit that you are not using can significantly improve your credit score, because lenders see this as a sign that you are not inclined to overuse credit, even when you have access to it. So pay down balances to zero but maintain the accounts, so that they will still show up on your credit reports as active accounts that you choose not to use. Does the credit card you no longer use or need have an annual membership fee? In that case, if the fee is hefty, then you may want to close the account to avoid the fee. But wait until your current credit card application goes through and is processed. Another option is to ask the credit card company to shift you into one of their other credit cards that does not have an annual fee. Oftentimes card companies are happy to downgrade your account in that way, in order to keep you as a customer.